One of the best things your computer consultant can do for your business is to protect your power. Here's what you need to know. First: Assess the reliability of your power. If your power goes out on a regular basis, you are probably very aware of it. Luckily, that's not a common scenario. But "brown outs" and power fluctuations can go unnoticed by people. Unfortunately, they don't go unnoticed by electronic equipment (computers, network equipment, printers, etc.). A "smart" battery backup (UPS or Uninterruptible Power Supply) will have a readout so you can see the measurement of electricity moving into your building and the amount being used by whatever's plugged into the UPS. With the right software (normally included for free), you can track voltage spikes and sags. If electronic equipment doesn't last as long as you expect it to, it might be because the power to your building is irregular. And that may be easily fixed! It might be the line from the utility company that needs to be fixed. Some areas just never have sustainably reliable power. That makes having a UPS a requirement. But even if you have the most reliable power, a UPS is still a good idea. So the first thing you should do is to assess the reliability of your power. The second is to verify that all of your important equipment is plugged into a working UPS. There are two pieces to that puzzle: 1) You need a UPS. 2) It should be working. Too many people buy equipment and then assume it will work forever. It won't. The most reliable thing a UPS will do is provide surge protection. That means it will protect you from electrical spikes that can come any time, even with most reliable power from your utility. The second thing a UPS does it to provide actual "conditioned" power. That means that the power supplied to your electronic equipment is stable. There are no spikes or sags that can blow out the electronics. The UPS does this in part through it's circuitry and in part because of the third thing it provides: a battery. Electricity flows into the UPS and charges the battery. The electricity might spike up and down, but the system reliably charges the battery. Power flowing out of the UPS flows through the battery. So the output is always consistent. Even if the electricity from your utility goes out altogether, the UPS continues to power equipment from the battery. Nice and even and reliable.
. . . Unless the battery's dead. If the battery can not longer hold a charge, then you basically have a very heavy surge protector. UPS batteries normally last about three years. You can always test one by plugging in a piece of equipment (I recommend a lamp, not a computer) and unplugging the UPS. If the equipment goes out immediately, your battery needs to be replaced. You computer consultant will probably be able to order one, unless the battery is super old. If you have a "smart" UPS, you should be able to get a readout that tells how how many minutes your UPS will stay up when the power goes out. This readout is notoriously wrong. A stress test will tell you the correct answer. With a stress test, you unplug the UPS and watch how long in actually takes for the battery to die. Your consultant can do this safely without causing problems with your computers. What Should be Plugged Into a UPS? You want to plug "electronics" into a UPS. That means computers, servers, network equipment, phone systems, and all the things that have those annoying plugs with rectangular boxes on one end or the other. Generally speaking, those things all have circuits inside that can be fried. - Other network connected equipment such as backup device, spam filter, etc. 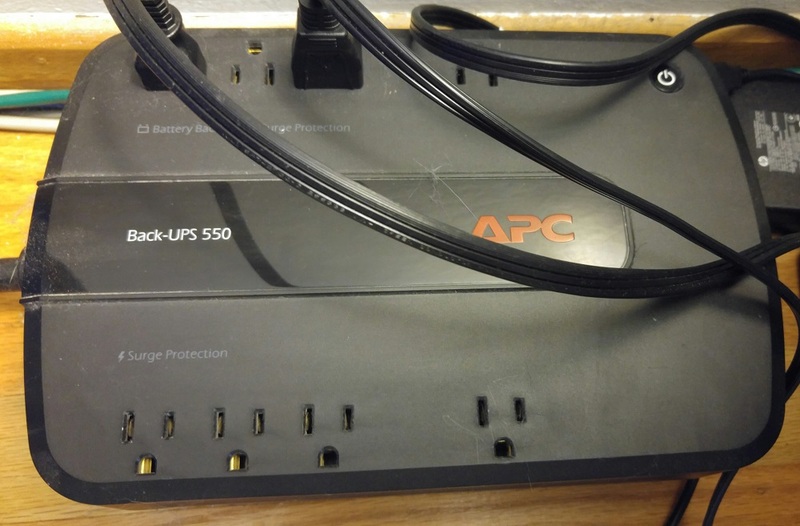 One time we had a large client (about 75 users) who had all kinds of stuff plugged into the UPSs, so we went through the office and put green electrical tape on the end of any cord that COULD be plugged into a UPS. If we ever found anything else plugged in, we were authorized to unplug it and work with the employee to find a safe place to plug it in. 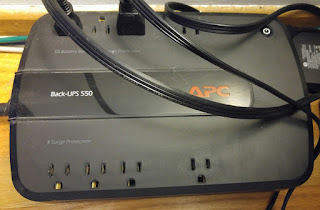 2) A surge protector is not a UPS (battery backup). When the electricity goes out, it's dead. 3) A good, brand name UPS can save you thousands of dollars. But they need to be maintained. Batteries need to be replaced. And they need to be tested from time to time. I get very frustrated with business owners who think they can buy something once and never put money into it again. You can't do that with anything in your life or business. Stuff gets old. It wears out. UPSs for every desktop cost a little money now. Consider a good UPS to be a three-year insurance policy for electrical problems. Depending on what you buy, that might be $100-$150 per desktop. For that you get uninterrupted work, no electrical spikes, and protection for unforeseen electrical problems. Plus you don't have to buy a new PC or monitor for that workstation due to electrical problems. It's rare to have a major electric problem. But they happen to SOMEONE every day. If you lost every piece of computer equipment in your office right now, how disruptive and expensive would that be? Talk to your computer consultant about tuning up your UPSs today.